TAMPA, Fla. -- The garden is a winding path through pine trees and palms. A pavilion made of wood and thatched with palm leaves is available among the poems posted along the path for visitors to stop, sit, and create their own sense of place. On Saturday morning, the USF Botanical Gardens will host a poetry reading to open its newest section: the Poetry Garden. The idea for the garden “germinated” in Jared White’s mind as a final project for USF English Professor Laura Runge’s class, Literature of Place: Florida. The display will feature poetry about nature on permanent markers throughout the area. 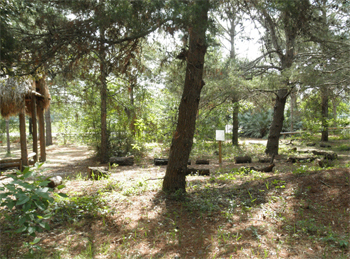 The opening reading in the Poetry Garden will take place at 10 a.m. Saturday, April 16. The idea for the garden came to White in a manner as poetic as the writing itself. Toward the end of the fall semester, he attended a creative writing conference at Flagler College, where he saw something tied to a tree and decided to investigate. This concept fit perfectly into Runge’s course, so White decided to bring that experience to the USF Botanical Gardens and literally combine poetry and nature, and his idea has been met with overwhelming enthusiasm. The poems featured in the garden will remain on display for approximately a year, and will be shown on a rotating basis.